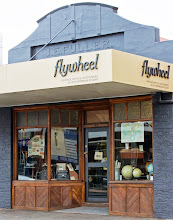 The Drill Hall Emporium: new in store . 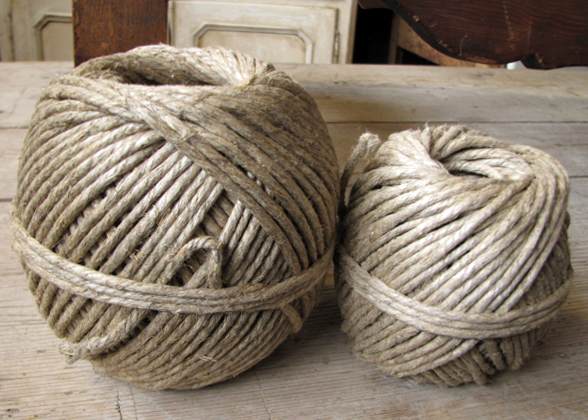 . . twine for everyone! I am sure I am not alone in my self confessed twine addicted state? Particularly balls of twines like these chunky versions, above. Are they not simply lovely and decorative? The large balls weigh in at one kilogram the smaller balls at half a kilogram. 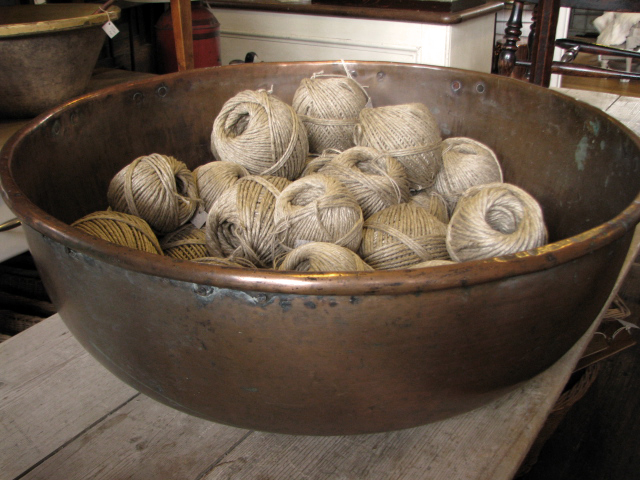 And what better way to display them then in our enormous copper patisserie bowl, which featured recently in its own right. These chunky twines are in a natural ecru colour and are made in France from linen. 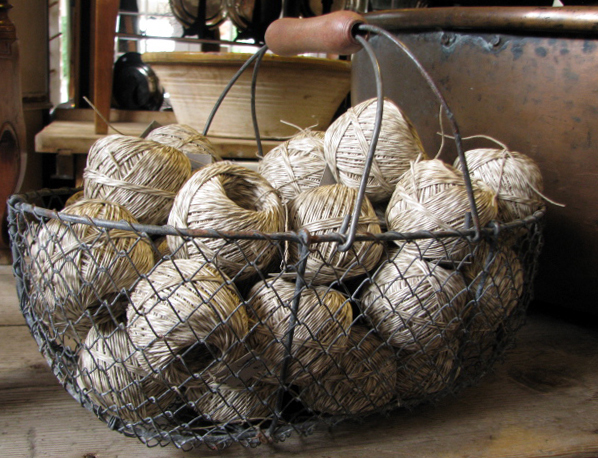 This twine in a French picker's basket, above, is much finer and weighs a mere 100g per ball. It too is linen and made in France and is two toned, white and ecru. Lastly, this twine is made from hemp and of a nice polished quality. I think we now have twine for every purpose. 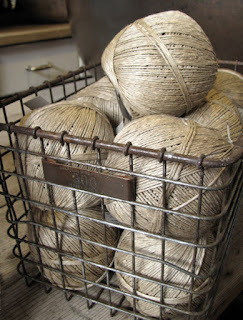 Yes, the twine balls look absolutely wonderful. 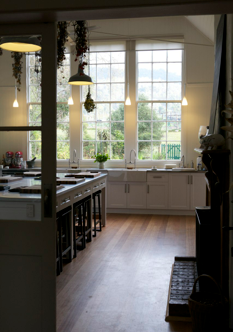 Somehow there is something particularly appealing about things which are both practical and beautiful and they do look marvellous displayed in your wire baskets! Life has been very busy here and I've found I have missed a couple of your blog posts, that will never do!!! 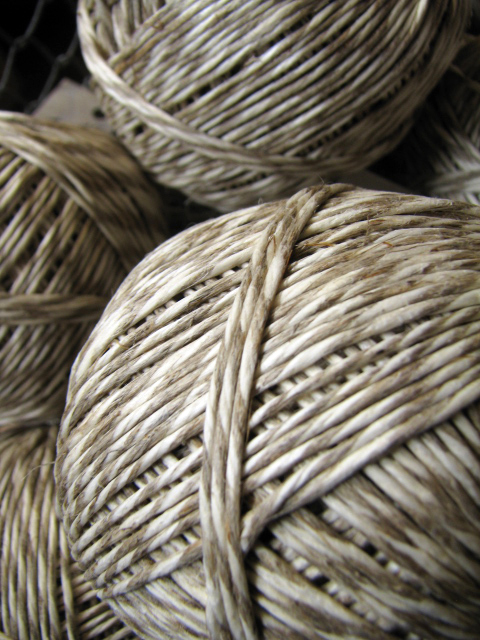 The twine is so textural, isn't it? There's just something about it. I think I may have the big one in your first photo, I have it sitting on a particular sideboard in the lounge room (wink). 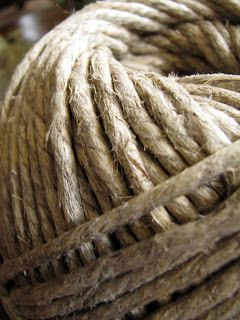 I could never use it, I have other twine that I do use but just can't bring myself to use this particular one. I'm a bit like that with some candles, but I digress (!!). I have also seen a bigger ball of twine and they sat that under a glass cloche and that looked really awesome. 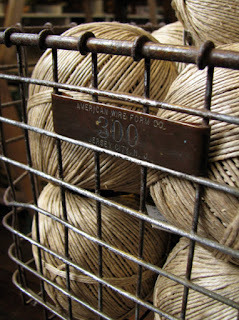 I love all the baskets too and am interested in how much with the last one with the brass labels please. Nearing the end of another week, I hope you have had a good one. They are still flying by. Off to work. Yes, there is something about twine and while it is functional it doesn't matter if you just have it for decoration, I think. And I was once like you with candles, but now we make our own at the store so I am getting used to burning them more regularly as it feels calming to have a nice scent wafting around the home. I might light one right now, actually! We sell the baskets for $125, the one pictured has more information on the brass label compared to the others we have. I will take a full sized image for you. Can you advise me where I can get my hands on some of this natural linen string? You can buy it from our store, The Drill Hall Emporium. Send us an email and we will advise prices and postage costs.